Camarillo, California, May 11, 2011 – PBS Biotech, Inc., a developer of state of the art single-use bioreactors used in the fast growing biotechnology market, announced today it has partnered with Refine Technology, Pine Brook, New Jersey to provide a powerful perfusion application providing high cell density solutions for biotech customers. The PBS 15 liter single-use bioreactor and the Refine Technology ATF4 system will be on display at the ESACT conference May 15-18 in Vienna.PBS Biotech® and Refine Technology, two technology leaders in cell culture development, are the ideal pair for biotech lab to production perfusion applications. 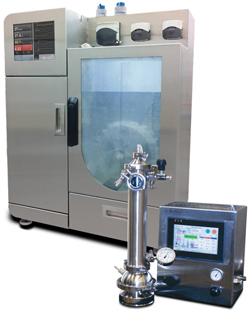 Boasting low profile, high performance and easy to use systems, the PBS Biotech 15L and PBS 80L single-use bioreactors can be configured with the Refine Technology ATF4 System and ATF6 System, respectively. Refine Technology was founded in 1999 with a vision to bring to the biopharmaceutical market cell separation systems that allow for increased productivity of cell derived biopharmaceuticals. Refine soon introduced its patented ATF System which is now being used in the development and manufacturing facilities of many biological and pharmaceutical companies.